John M Allegro – “The Dead Sea Scrolls: A Cover-up?” April 18, 1984. 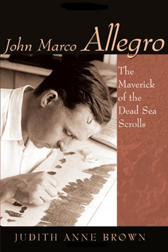 John M Allegro – The Dead Sea Scrolls: A Cover-up? April 18, 1984. Produced and broadcast by Ian Walker of Piccadilly Radio, Manchester, England. Why, after 30 years, was John Allegro the only scholar to have published all the scroll texts allotted to him? Why were the others so reluctant to discuss differences of interpretation, or welcome the light that the scrolls shed on the origins of Christianity? None of the four scholars interviewed (Allegro, Yadin, Benoit and Broshi) accepts the popular conspiracy theory about a deliberate cover-up. But Allegro holds that, though not amounting to suppression, he definitely experienced a go-slow, a reluctance to challenge or even debate accepted views on the uniqueness of the gospel story.